Despite all the promises of technological innovation, the proliferation of automated machines will harm financial prospects for working people in the following decades. According to Digital Trends, robots are likely to replace around five million jobs by 2020. Beyond the threat of job destruction, Massachusetts Institute of Technology researchers have found that the effect of creating one robot for every thousand workers is a decrease in wages by about 0.25–0.5 percent. As robots are continually engineered to be more efficient and productive than humans, their work is valued at lower costs and is preferred over human labor. But this change doesn’t only affect blue-collar and administrative work; with the advent of artificial intelligence and machine learning, automated machines have already begun to substantially impact skilled professions, such as surgery and accounting. Additionally, reliance on technology allows corporations to find loopholes in providing worker benefits. Uber and Lyft, for instance — businesses that utilize apps in providing services — categorize their drivers as independent contractors rather than employees to avoid extra fees, leaving workers without proper coverage and protection. This trend of prioritizing profits at the expense of uncompensated employees — one so prescient in these apps — will likely be worsened as technological advancement integrates technology with employment. The expansion of automation brings heavy implications beyond the economic sphere. Although we are in the age of connectivity, the next decades will inevitably witness people physically withdrawing from reality by immersing themselves in virtual worlds, sometimes with great consequences. Virtual reality will allow those dissatisfied with their lives to not only escape into more ideal digital worlds, but ultimately prefer virtual fantasy to real life. This will consequently hinder physical connection and intimacy in human relationships. As an extreme example of technological innovation being detrimental to human interaction, a Japanese virtual reality game allowing users to sexually assault women characters was released last summer. The future of the digital age may distort the authenticity and moral standards surrounding human connection, and desensitize users from the true weight of their actions, rendering them lost and physically detached in virtual worlds. At its core, technology is a beautiful and wonderful tool of humanity that has the potential to elevate standards of living to previously unimagined levels. Yet, despite this incredible potential for growth, many have come to see technology and automation of labor as malevolent job-destroyers intent on dismantling the livelihoods of millions of Americans who rely on their unskilled labor to earn a living. The truth, however, is far more nuanced. 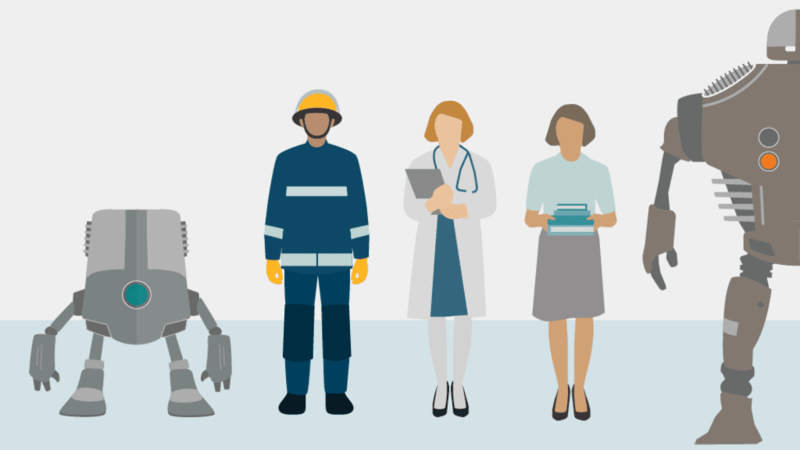 Although automation will indeed reduce the labor needs of some professions, it will also open up entirely new job industries for workers to enter. According to the Economist, labor costs related to weaving and textile production during the 19th century dropped 98 percent after improvements in automation. Yet, this did not destroy weavers’ livelihoods since they simply migrated from directly producing the cloth to managing the machines. Furthermore, the price of cloth dropped substantially, hugely increasing demand and, as a result, increasing total employment by over four times the original amount from 1830 to 1900. Automation, therefore, does not destroy labor but rather changes it and forces workers to adapt to a new job role. The same situation is unfolding in the modern day. Automated improvements in the transportation industry (which is expected to see massive changes in employment) will result in drivers moving toward maintaining the self-driving trucks. Grocery store cashiers will migrate to overseeing large sections of self-checkouts rather than their own individual lane. Chefs will become waiters or managers (which still require a personal touch). All of these improvements will result in lower prices and a higher standard of living. Furthermore, the increased automation of labor opens us up to explore the creative aspects of humanity. Similar to how specialization of labor helped allow early tribes to become powerful civilizations and create incredible works of art, the reduced demand on routine labor will allow humanity to focus on deeper, more important questions in both STEM and humanities. We will undoubtedly see an explosion of higher learning, deeper research and great works of art that will define the post-Information Era of humanity.